EghtesadOnline: A total of 2.48 million tons of finished and semi-finished steel products were exported from Iran during the first three months of the current fiscal year (March 21-June 21) to register a 24.6% growth year-on-year, the Iranian Steel Producers Association announced. Semi-finished steel made up 1.85 million tons of the total export volume, up 9% YOY. Billet and bloom had the lion’s share of semis exports with an aggregate of 1.05 million tons to mark a 40% growth YOY. Slab followed with 803,000 tons, down 15% YOY. Exports of finished steel products surged 111% YOY to 633,000 tons, according to Financial Tribune. Hot-rolled coil was the main exported finished product with 242,000 tons, registering a 611% jump YOY. Following HRC were rebar with 291,000 tons, up 55% YOY; beams with 46,000 tons, down 2% YOY; “other steel products” with 29,000 tons, up 71% YOY; coated coil with 17,000 tons, up 55% YOY; and cold-rolled coil with 8,000 tons, up 100% YOY. This is while exports of direct-reduced iron dropped 21% YOY to 178,000 tons. The government has targeted 9.5 million tons for this year (March 2018-19) and 14 million tons by the end of March 2020-21 fiscal year. Imports of all steel products were either down or unchanged during the period under review compared to last year’s corresponding period. The ISPA report shows that steel imports stood at 299,000 tons, down 52% YOY. Semis imports, which only consisted of billet and bloom, made up 6,000 tons of the total figure, the same as in last year’s Q1. Billet and bloom imports remained at 5,000 tons and slab at 1,000 tons. Imports of finished steel dropped 53% YOY to 293,000 tons. The imports mostly included CRC with 96,000 tons, down 41%; HRC with 88,000 tons, down 71%; coated coil with 72,000 tons, down 27%; rebar with 12,000 tons, down 57%; “other steel products” with 18,000 tons, down 10%; and beams with 7,000 tons, down 46%. Iranian steelmakers produced a total of 11.45 million tons of products during the three-month period to register a 12.5% growth compared with last year’s corresponding period. Semi-finished steel made up 6.29 million tons of the total output, up 19% YOY. “Billet and bloom” output made up 3.36 million tons of all semi-finished production while slab output hit 2.93 million tons to register 24% and 13% year-on-year rises respectively. As for finished steel, output increased 6% YOY to reach 5.16 million tons. Hot-rolled coil had the lion’s share of finished steel production with 2.09 million tons, up 13% YOY. It was followed by rebar with 1.7 million tons, up 6%; cold-rolled coil with 563,000 tons, down 10%; coated coil with 347,000 tons, down 13%; beams with 246,000 tons, up 47%; and “other steel products” with 205,000 tons, down 9%. Iran’s direct-reduced iron production is registering a healthy growth. It stood at 6.58 million tons during Q1, indicating a 27% rise YOY. 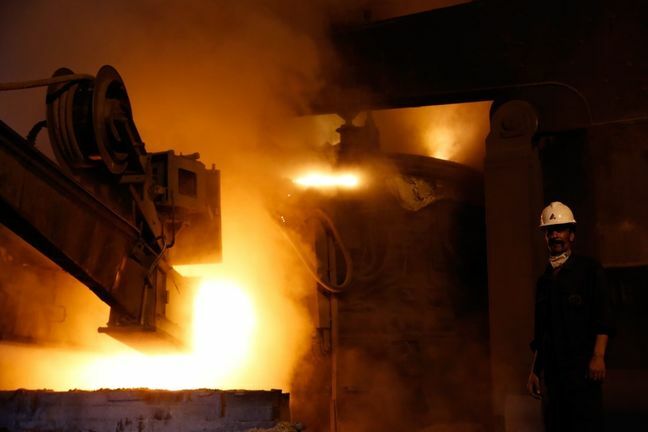 The Iranian steel industry plans to increase its crude steelmaking capacity to 55 million tons by 2025 and become the world’s sixth largest steelmaker. According to the Minister of Industries, Mining and Trade Mohammad Shariatmadari, about 30 million tons of the target capacity have been realized so far. According to ISPA, Iran’s apparent steel usage—defined as production plus imports minus exports, sometimes also adjusted for changes in inventories—stood at 4.4 million tons for semis to grow 23% and reached 4.8 million for finished products to drop 7% YOY. Hot-rolled coil had the lion’s share of finished steel consumption, as it reached 1.9 million tons, down 8% YOY. It was followed by rebar with 1.42 million tons, down 2% YOY; cold-rolled coil with 651,000 tons, down 17% YOY; coated coil with 402,000 tons, down 17% YOY; beams with 207,000 tons, up 56%; and “other steel products” with 194,000 tons, down 15% YOY. As for semis, usage of billet and bloom grew 18% to 2.31 million tons, while that of slab rose 28% to 2.13 million tons. DRI usage was up 21% for the period to 6.4 million tons. The ISPA report came after preliminary statistics released by the Iranian Mines and Mining Industries Development and Renovation Organization in mid-June, which only took into account data on large-scale Iranian steelmakers.